Sweep on shimmer...this is pretty much perfection for a royal complexion. Delightful Icing Sugar leaves skin sparkling, fresh and luminous. 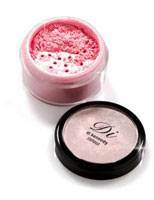 Give your face a glamorous glow with this Di Kennedy original. As beautiful to look at as it is to wear, Icing Sugar contains special photo-reflective pigments to help reduce the appearance of fine lines and gives skin a radiant luminosity. Dust on cheeks, decollotage, shoulders, legs, arms, back and even tummy for sparkling impression.